I've been lucky enough to be in more than a few weddings over the years, but I'm pretty sure my stint as a bridesmaid is officially over. 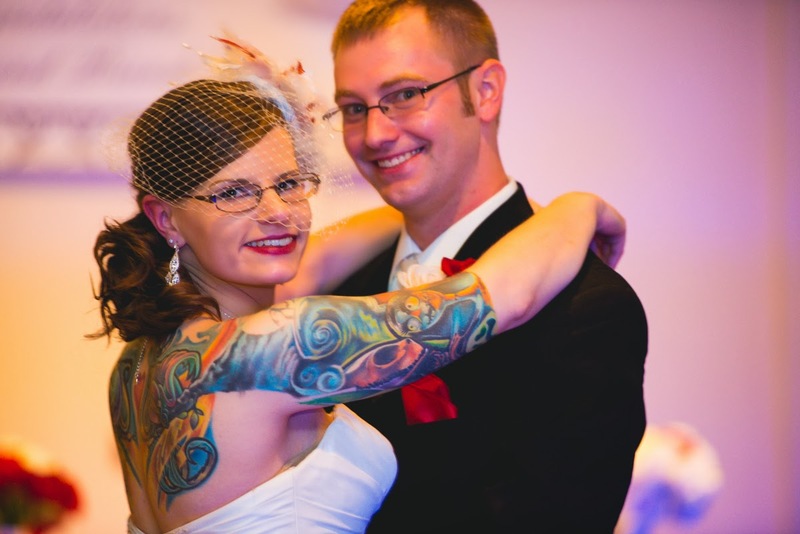 Just two weeks ago my oldest friend finally got married to her long time boyfriend. It made me so happy to witness and be a part of Brandi's special day. I'm a sucker for cute couples and Brandi and Nick definitely fit the bill. They asked Adam to take pictures of their big day and for doing so Brandi painted a picture of Kaiser for him. Not only was it the best gift ever, but it turned out AMAZING! Brandi is a tattoo artist and as you can tell from this picture she is true artist. She has painted a number of pet portraits, but I was stunned by the perfection of this one. Maybe I'm a little partial, but she made Kaiser come to life in this picture and it blew us both away. 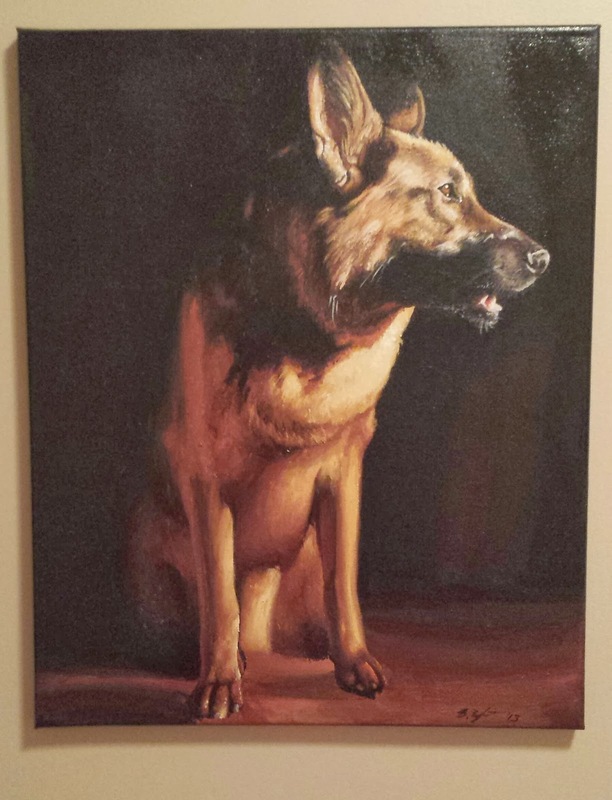 The painting was from a picture that Adam had taken and while the photo is good, there is something extra special about having a painting of our fury son. Like I said, she has does a number of pet portraits and if you are interested in having a portrait done visit her Etsy page HERE. 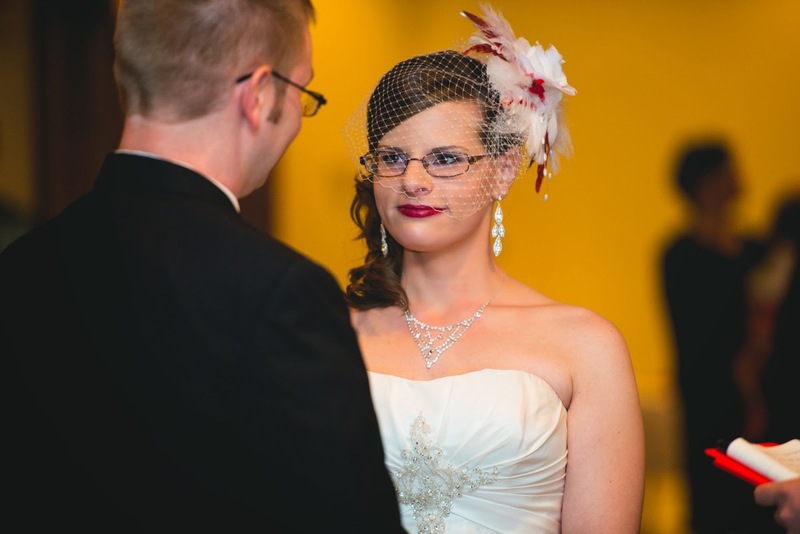 Since Adam was the photographer, I have special access to all her wedding pictures. Being an artist, Brandi used creative talents in many ways putting her special touch on a number of things. 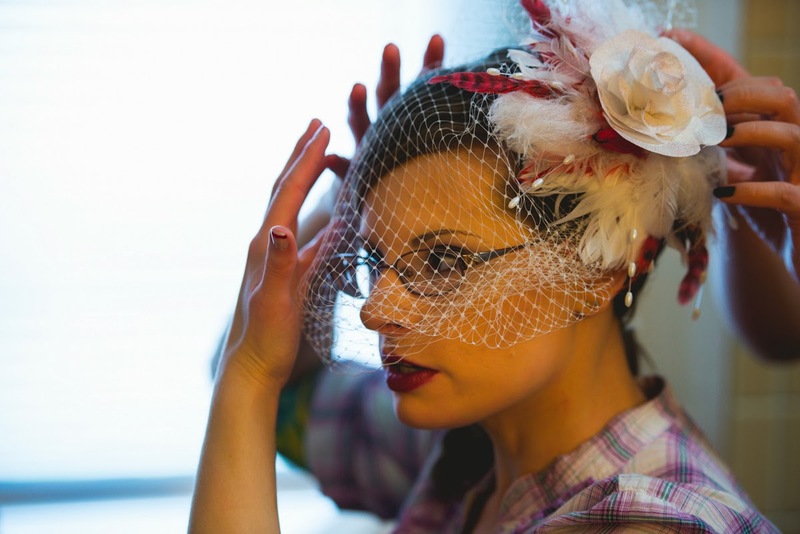 The most amazing being her birdcage veil that she MADE HERSELF. She even used pieces of her Mom's wedding dress to make it. It was perfect and perfect for her. She was truly a gorgeous bride. 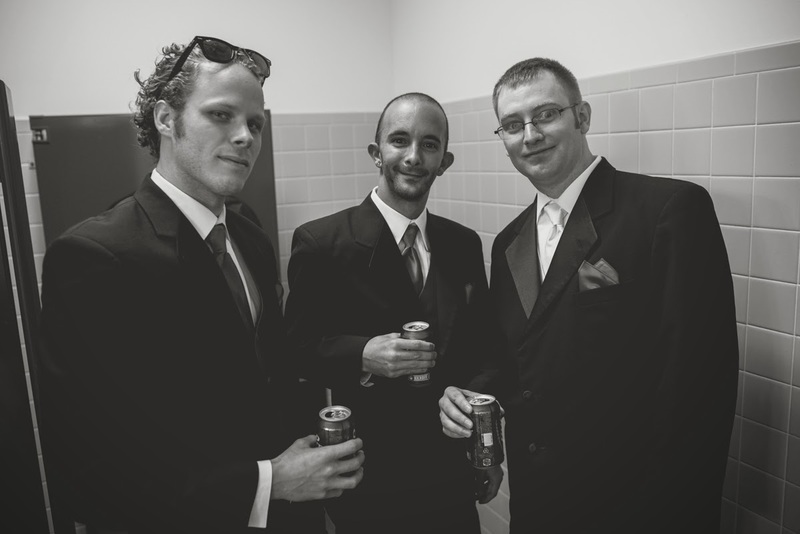 Nick with two of his groomsmen. 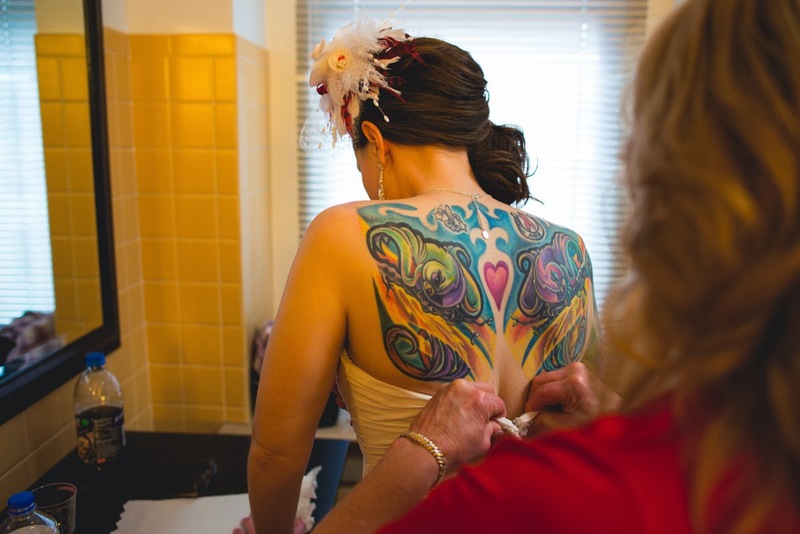 As a tattoo artist it's no surprise Brandi has a few of her own including this colorful back piece. 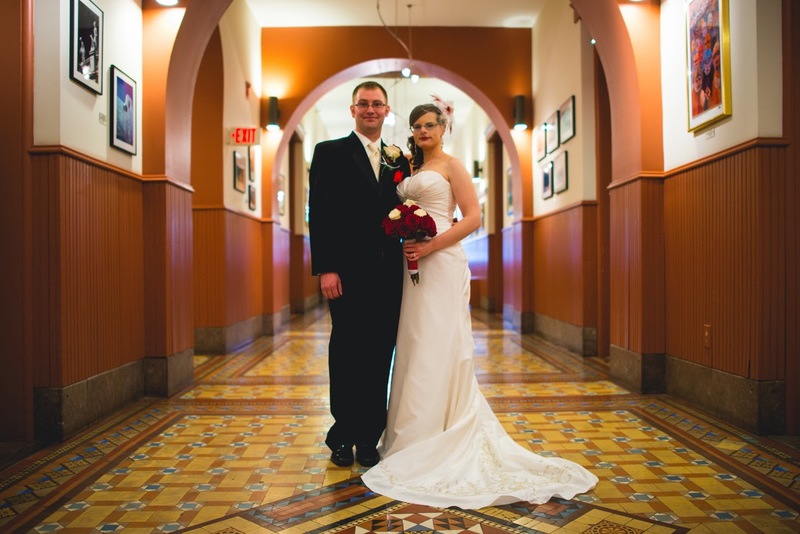 Adam loved how it took traditional wedding pictures like putting on the dress and added a cool element. 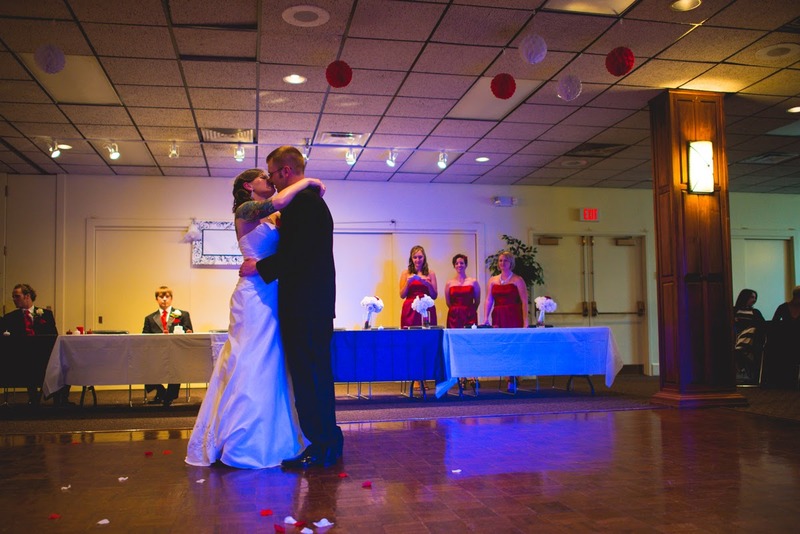 This was shot just a minute before the ceremony began when the flower girl and ring bearer first saw her. Not being a fan of lots of attention Brandi was a bit nervous, but I think these two helped to ease her nerves. I love the small smile on her face here. Being huge UofL fans they decided to have a red and black theme. 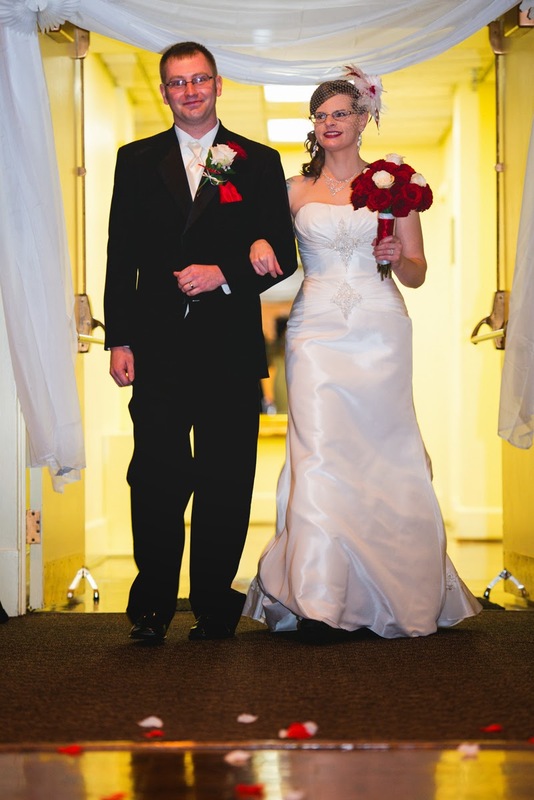 It was a great choice and Brandi looked stunning in her white dress with red accents. The girl can pull off red lips! 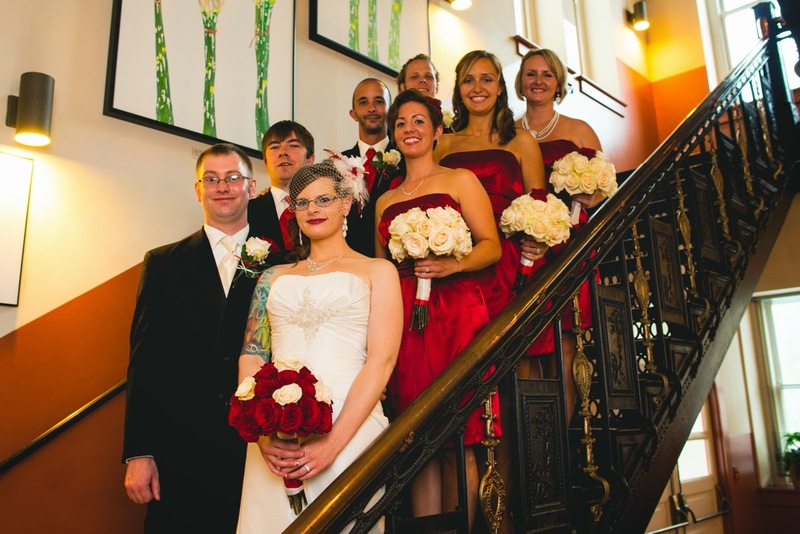 The Bridal Party. Oh and Brand made all of the flowers too. Not only did she save a ton of money, but I think she did a better job than most florist. 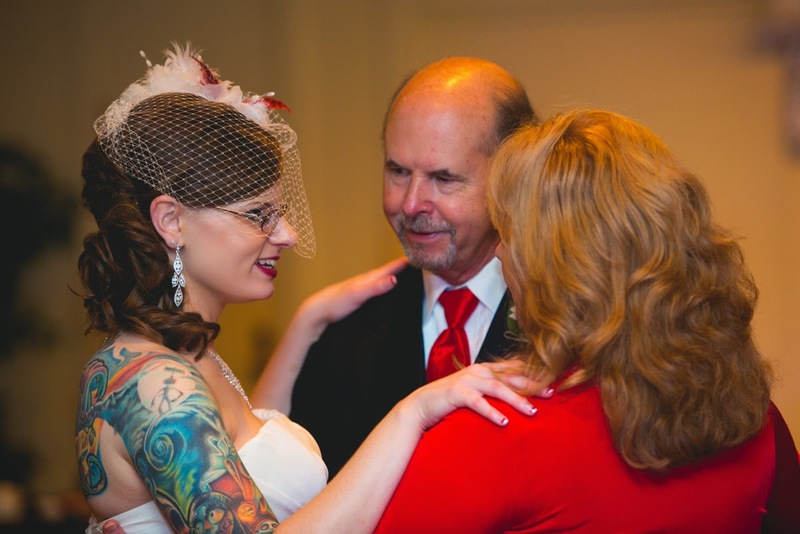 Brandi dancing with both of her parents. 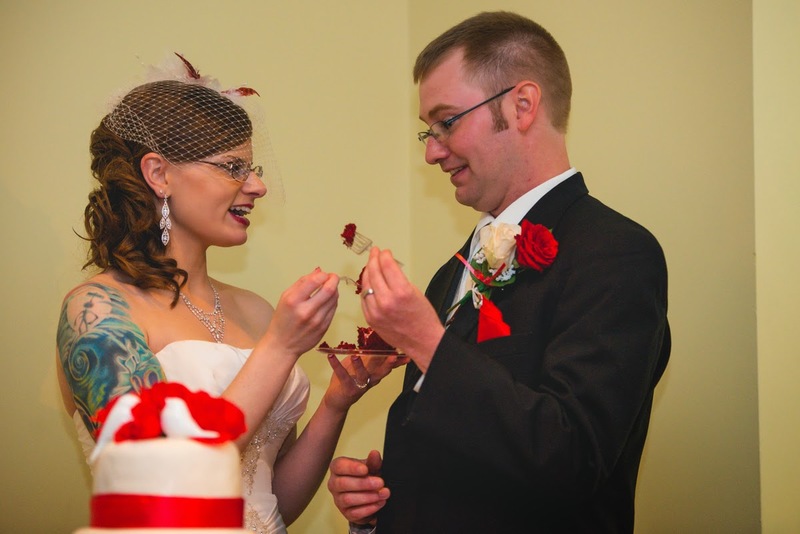 It was a great wedding and I know it will followed by a great marriage. Their true happiness and love for one another was captured in that day. It was an honor to be a part of it. And lastly, here is picture of me and my date. I was happy to say I snagged the photographer. 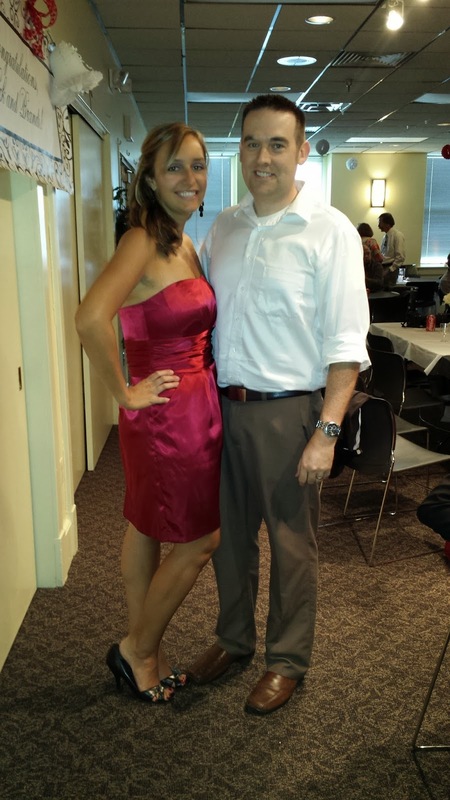 Gotta love weddings!